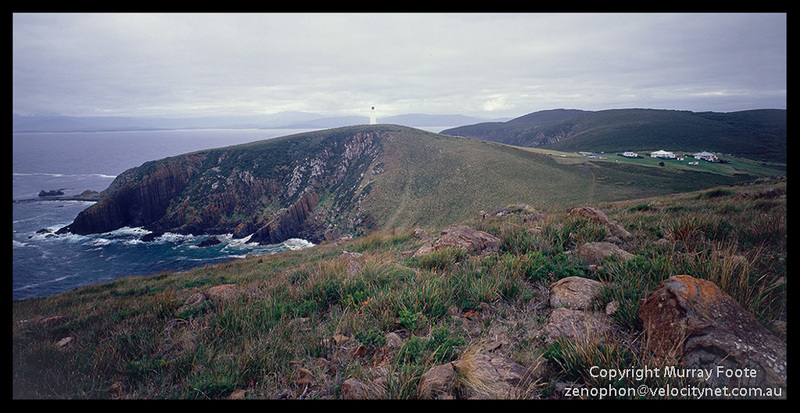 I visited Cape Bruny lighthouse on 23rd April 1987. Here we are looking directly up as the lighthouse pretends to be a nautilus. 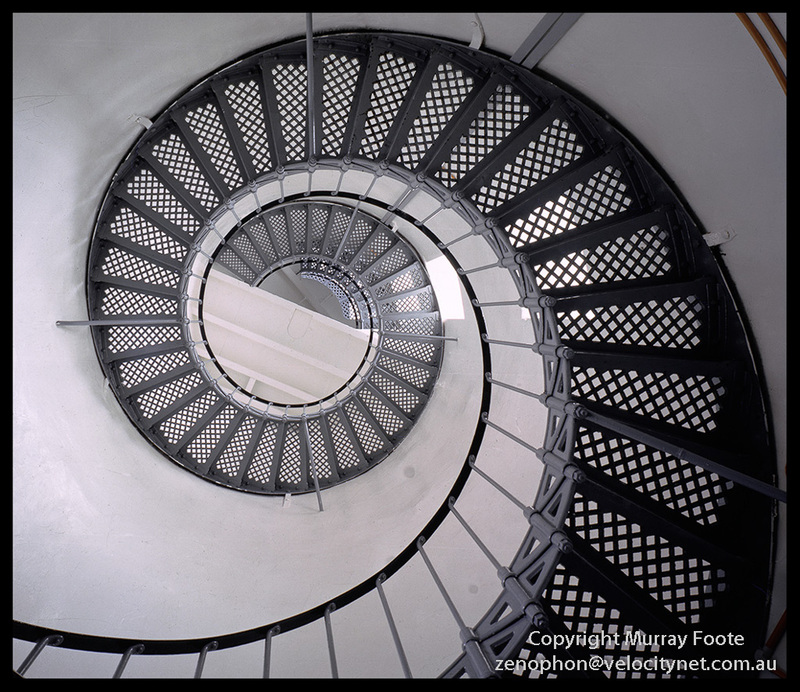 The cast iron staircase was manufactured in Britain and assembled on site. While it is bolted to the wall, it largely supports its own weight. Although I used a tripod, I was lying on my back on the middle of the floor when I took this shot. The Cape Bruny lighthouse is on the southern tip of Bruny island and commands the D’Entrecasteau Passage on the south-western approach to Hobart. Governor Arthur recommended a lighthouse as early as 1825 but nothing was done at that time. Then three ships went down in 1835. One hundred and thirty-four drowned with the convict transport George III (and probably many in chains), seventeen drowned with the Enchantress and no lives were lost when the Wallace went down. This led to the construction of the lighthouse in 1838, which was built with convict labour. It is not possible to combine the two preceding images into a panorama because they were not taken precisely at the same places and the perspective is different. The second image shows the lighthouse cottages as well as the lighthouse. One lighthouse keeper, William John Hawkins, stayed at Cape Bruny lighthouse for thirty-seven years, from 1877 to 1914, the longest duration of any lighthouse keeper. This entry was posted in Australia, From Dusk Till Dawn and tagged Architecture, Australia, Bruny Island, Cape Bruny, History, Landscape, Lighthouses, Photography, seascape, Tasmania, Travel. Are any if your images for sale? I’m not making any attempt to sell any at the moment but they can be for sale. I do my own custom printing and the charge would be $80 for an A3+ print (unmatted and unframed). I’m about to go overseas at the moment though and will be back after 10th March.